A 4-2 result puts the tally for the season 49-14 as we head into the home stretch of the 2017 season. Both division races are still up for grabs though that may change Saturday in Los Angeles. The festivities get an early start with UCLA visiting Utah to kick off a full slate of conference action. A review of last week’s match-ups gets us underway. The headlines were there for the taking and until the last possible second the Benny’s did just exactly that. Oregon State’s performance shouldn’t be diminished by the absence of Stanford’s Bryce Love. Had he played the score would have much, much different I understand. Or he could have rolled his ankle on the second snap. The point is the Beavers addressed what it was they could control and left the rest alone and very nearly knocked the Cardinal out of the north division race. That’s a skill a team can build on. Almost like clockwork it seems every time the Sun Devils tease with a couple of impressive outings and enter the division race conversations they find a way to torpedo that new found attention in spectacularly bad fashion. As it was in ASU’s face-plant in front of the hometown crowd that saw the Sun Devils give up 507 yards of total offense – 341 on the ground – to end any flirtations with a southern division championship. That inside track now is USC’s with only Arizona still in position to have a say in the matter. Leading 20-9 at the half, the Huskies put the game away with a 17-point third quarter. Adding injury to insult, Bruin quarterback Josh Rosen injured a finger spent the second half on the sidelines. The Khlil Tate story continues unabated – 10/17, 275 yds, 2TD passing and 13 carries for 146 yards and another score. The Cougar offense and quarterback Luke Falk was wasn’t up to the task and was benched in favor of back up Tyler Hilinski. At first the move paid off with Hilinski rallying the Cougars fro a 20-7 deficit to a 27-23 third quarter lead. But four interceptions did him in and the Wildcats pulled away with 21 fourth quarter points. The Buffaloes followed Ralphie out of the gate and trampled Cal with 27 points by halftime to end the discussion early. Colorado’s Steven Montez had his best outing of the season with three TD passes while completing 20 of 26 for 347 yards against what had been an improving Cal defense. Phillip Lindsay’s 161-yards on 33 carries was a big piece of the damage as well. The passing game remains mostly non-existent but to make a baseball analogy if only one pitch is working you have to find a way to win with that one pitch. 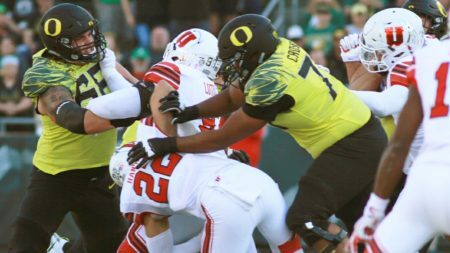 Oregon did just that against Utah on Saturday. With only the running game to rely upon the Ducks held their blocks and spread the point of attack from sideline to sideline with a combination of sweeps and Royce Freeman between the tackles to roll up 347 yards of turf against what is traditionally a stingy Utah defense. For the southern division championship. USC wraps up at Colorado then home against UCLA while the Wildcats face Oregon and ASU, both on the road. USC has not always played to their abilities and injuries have hit the roster hard; that said the Trojans looked to be a complete team in dismantling ASU last weekend in Tempe. Arizona’s Khalil Tate is the hands down conference player of the year but the Trojans are the southern division champs, 38-33. A Colorado upset would continue a trend of late season swoons that had ASU head coach Todd Graham on a hot seat until his team ripped off a pair of impressive conference wins. If the collateral damage of last week’s stumble against the Trojans includes a loss to the Buffs those conversations about Graham’s tenure will resume. Can the Beavers come away from Strawberry Canyon with their first Pac-12 win of the season and the first road win for the program since before Mike Riley left for Lincoln? Absolutely, they could. Cal was unimpressive in their loss to Colorado and will need to make strides on several fronts if they are to regain the footing they seemed to be gaining as they swept their non-conference schedule. The road through the Pac-12 has been rockier but respectable outings against USC and Arizona plus an upset win of WSU have the Bear’s trending upwards. So too the Beavs since the departure of Gary Andersen but this is their first game away from home under interim coach Cory Hall and that will be the difference. Cal 31-28. The good news is that if Oregon can keep the ball out of the Huskies’ hands and move the ball on the ground the way they did against Utah and upset isn’t out of the question, particularly should Justin Herbert make a return to the lineup. The bad news is Washington’s defense has match-up advantages for Oregon than did the Utes. Fast and physical is the way every Chris Petersen defense has been built and when playing to their talent this years’ group is as good as any in the conference. When Washington has struggled it has been when the offense misfires, as they did spectacularly in the loss to ASU. Given that kind of performance, yes Oregon could upset the Huskies. But truthfully that result is more likely next season. Washington 34-21.